On 7 April, stars from the world’s leading ballet companies will come together for Against the Stream, a one-off gala performance accompanied by a live orchestra at the London Coliseum. The star-studded international cast features principal dancers from Paris Opera Ballet, New York City Ballet, The Royal Ballet and English National Ballet in a celebration of some of ballet’s greatest pioneers. The gala – which is masterminded by dancer-turned-producer and former principal of The Royal Ballet, Ivan Putrov – champions the mavericks of the ballet world who broke with tradition, pushed against the boundaries of the art form, and established the foundations for the rich and varied world of dance today. The programme will include masterpieces by choreographers including Jerome Robbins, George Balanchine and Kenneth MacMillan. Against the Stream will be a celebration of the genius, vision and trailblazing talent these choreographers represent and the immense and powerful legacy they left behind. Dancers confirmed for the gala include Matthew Ball, Principal Dancer of The Royal Ballet; Mathieu Ganio and Eleonora Abbagnato, Étoiles of Paris Opera Ballet; Maria Kowroski, Principal New York City Ballet; Marcelo Gomes, Guest Principal; Dmitry Zagrebin, Principal of The Royal Swedish Ballet; and Katja Khaniukova, Soloist with English National Ballet. Works confirmed for the evening’s gala programme include Diana and Actaeon Pas de Deux (Vaganova), Le Parc (Preljocaj), Suite en Blanc (Lifar), Diamonds (Balanchine) and In G Major Pas (Robbins). Ivan Putrov was born in Kyiv, Ukraine to a ballet family. He trained at The Kyiv State Choreographic Institute and at The Royal Ballet School. Upon graduation Sir Anthony Dowell invited him to join the company, where he became a principal after three seasons. International appearances include leading roles with the National Ballet Companies of Cuba, Hungary, Ukraine, Lithuania, England, Mexico, Georgia, Vienna Staatsoper, Asami Maki Ballet Theatre and with The Royal Ballet in many of the world’s most renowned theatres. In 2009 Ivan was made an Honorary Artist of Ukraine. 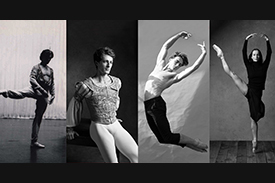 In 2012 Ivan conceived and produced Men in Motion, an exploration of the changing role of the male dancer over the last century. It re-wrote the rules for the male ballet dancer and played to huge audiences around the globe.